Why Learn The Dorn Method? "I attended Brigitte’s Dorn Method Workshop and really liked her style of teaching and the fact, that she learnt it directly in Germany from Dieter Dorn. The knowledge that I have gained from Brigitte's workshop has inspired me to utilize this method on most of my clients! This has brought great relief to my clients and success to my practice. I would definitely recommend her workshop to anyone who would like to treat their own client’s back pain in a gentle and safe way without having to refer them." "Thank you for a great workshop & great teaching method. After completing workshop I went home & treated my mum for scatica after just 1 treatment of dorn she was pain free having tried so many holistic therapies, GP/hospital visits this was the only thing that helped i am so glad i came on the course. looking forward to advance workshop :)"
Who Should Learn The Dorn Method? I started using the Dorn Method over 13 years ago and to my delight saw immediate positive results. Fast forward to today and I now run my own Dorn Method clinic in Stratford upon Avon where clients come to see me simply based on referrals. I receive great recommendations and feedback all the time because Dorn just works! Back pain is so very common it therefore just makes sense for people involved in healthcare to learn basic Dorn Method principles; it's such a valuable skill you can easily and quickly take on board at relatively low cost, and which can also help you develop your own business. Learning Dorn will give you a great skill that you will find invaluable, it's the perfect 'bolt-on' therapy that will complement your existing practices. You will discover a set of easy to learn, safe Dorn Method techniques that will enable you to help your clients overcome a list of common health conditions. Additionally, you will also be able to show your clients simple self-help techniques that they can take away with them. Even those not involved in a professional capacity can benefit by being able to help family and friends who suffer from common ailments such as Back Pain, Sciatica, headaches and the like. Dieter Dorn wanted the Dorn Method to be available to all and its techniques are relatively easy for most people to learn as well as safe to apply. Back pain is very common, in fact it is probably the single most cause of time missed away from work. I know many of my clients who originally came for other treatments such as Indian Head Massage ended up getting Dorn Method therapy for their back pain too. It can affect people of all ages, and be very painful and debilitating. Therefore doesn't it just make sense to have the knowledge and skill to be able to help people who suffer from this common health problem? The Dorn Method is such a valuable skill to have that will pay dividends over and again. The Dorn Method is one of the easiest to learn Back and Joint care therapies you'll come across, making it absolutely ideal for all Complementary Therapists, especially those who are cost conscious or limited for time. An intensive two day workshop will teach you all the fundamentals enabling you to start helping others straight away. Some people wonder how it is possible that Dorn can be so effective when there is such a short learning curve, but as in most things in life, it doesn't have to be complicated to be successful, and in the case of Dorn its own success speaks for itself. Dorn focuses on restoring balance to the body using very effective and easily learned techniques. You can read more about how Dorn works by following the links on the upper left of this page. Being a Complementary Therapist able to successfully help people with their Back and Joint pain, has brought me many new Clients through word of mouth recommendation, something I found harder to achieve with my other Therapies offered. Learning Dorn will give you a valuable skill that can enhance your career prospects, and if you practice Dorn regularly so you become more proficient at helping others, this can only help your reputation and develop your business. I recently received news from a Complementary Therapist who attended one of my workshops only a few weeks ago, praising the effect Dorn is having, saying "...I really believe in this method...I never realised the effect it would have on everyone including myself." Dorn has shown itself to me as a very safe and gentle treatment, and in fact there are no known reports of any injuries to Clients in it's whole 36 year history. One common issue many people who need Back pain treatment have is the fear or dislike of the 'clicking' and 'crunching' of joints or vertebrae associated with other treatments, this is something not associated with Dorn treatment. During Dorn treatment simple corrections are made with the Client working together with the Therapist to help joints and vertebrae slip gently back into place without resistance, clicking or crunching; this muscle 'distraction' technique is part of why Dorn is so successful. Furthermore, Dorn can also include a very relaxing massage called the Breuss Massage which safely stretches, nourishes, aligns and energizes the Back. Business for a Complementary Therapist can be tough because there is a lot of competition from others offering the same treatments. It is also the case that many treatments such as Indian Head Massage or Reflexology can be viewed as 'treats' or 'unnecessary'. However when people are in pain, such as with Back Pain, there is more of an urgent need to have it sorted out, and as nearly everyone will suffer some form of Back or Joint pain at some point in their lives, it can be seen that there will always be a demand for someone who can successfully help people with their pain; and is why offering The Dorn Method can really help to generate better business and therefore increased long term income potential. Although The Dorn Method has been used successfully for over 35 years in Germany, it is relatively new here to the UK. To put it into perspective, there are 60 million people in the UK, and only a few Dorn Method practitioners at this time. This offers enormous opportunity for new Dorn Therapists to establish themselves and build a reputation in their area where they live, free from competition. There really has never been a better time than right now to learn and begin practicing Dorn. As mentioned above, The Dorn Method has been growing successfully in Germany for over 36 years; however it is also growing all over the world with courses being held in Australia, Ireland, Canada, Hong Kong, The Philippines and of course the UK. In Germany, there are now thousands of Dorn Therapists and some of these also include medical professionals such as Doctors, Physiotherapists, Chiropractors, Osteopaths, etc. There are also many seminars and conventions that now take place every year - a sign of things to come over here in the UK! 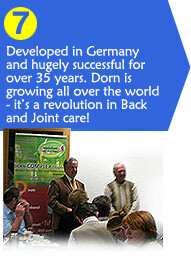 The growth of Dorn in Germany and now around the world offers proof of its success in treating Back and Joint pain. Personally, I myself have never been busier with word of mouth recommendation sending me clients as far away as London and even Africa! I literally have had several clients come up by train all the way from London to have treatment here in Stratford upon Avon, after trying alternative therapies but with no success. One client even flew from Africa because she heard how effective Dorn was - after which she became a student! The Dorn Method works so well because it consists of a range of excercises and techniques which help joints and vertebrae slip back into their natural positions using muscle 'distraction', which is a successful method of actually working together with the body. Dorn doesn't just focus on giving Clients a few treatments and that's that, but is instead a combination of three parts which together provide an excellent maintenance and preventative joint care system which is designed to look after our bodies over the long term. For example, Clients who come for treatment are shown a range of simple excercises to take away with them, and which aim to help them stay in shape thereafter. In most cases The Dorn Method works quite quickly to restore balance and relieve people from their pain, and who are then subsequently able to quickly get back on with their lives. There is nothing quite like the feeling of being able to help free people from their pain and discomfort, which generates a lot of joy and personal satisfaction. My Dorn Method Workshops have been accredited by the Federation of Holistic Therapists (FHT) and the Complementary Therapists Association (CThA). This means Therapists coming on to the Workshops can gain valuable CPD (Continuing Professional Development) points, and of course The Dorn Method is now also covered by Insurance. For more information, please visit the FHT website or the website of the CThA. 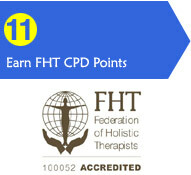 I believe the FHT grants 10 CPD points for successfully completing my workshop.